Today is national lima bean respect day! 1. Preheat the skillet over medium. Cut the 3 pieces of bacon in half, creating 6 shorter pieces of bacon. 2. Add the bacon to the preheated pan. Brown, then remove with tongs and allow to drain on the plate covered with paper towels. 3. Add the diced onion to the pan and cook until tender and translucent. 4. Add the lima beans and season with salt and pepper. Cook, stirring occasionally, until tender, about 10 minutes. 5. 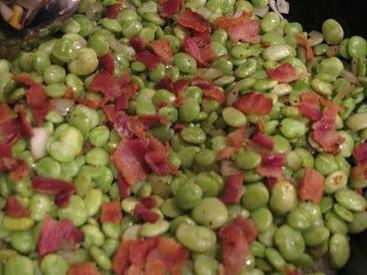 Crumble the bacon and add it to the lima bean mixture. Add the red wine sherry. Stir to blend. Serve 4.